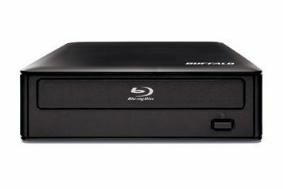 Buffalo Technology introduces external Blu-ray drive for £190 | What Hi-Fi? The snappily-named BR-X861U2-EU attaches to your computer via any USB 2.0 port and needs no additional power supply or complicated installation. It's designed for storing, editing and watching high-definition content, or writing large amounts of data to an optical disc. It's also backwards-compatible with DVD and CD. The 8x drive features built-in CyberLink Blu-ray disc suite software which allows users to watch their DVDs in "near high-definition quality". "This new external BD drive provides consumers with a low-cost option for watching their own HD content and taking advantage of the latest technology," says Paul Hudson, northern European sales director, Buffalo Technology. Buffalo's BR-X816U2-EU is available now from Amazon, Dabs, Insight, Misco and other leading retailers.